1900s Movies became a popular attraction in amusement arcades, music halls, traveling fairs, wax museums, and vaudeville houses in many countries. However, audiences had become bored with actualities (daily life scenes) and films of news events (real and reconstructed). 1900 The Eastman Kodak company first introduced the Brownie camera, a very simple cardboard box camera that used roll film. Its original list price was $1.00. 1900 At the Paris World's Fair (The Exposition Universelle), early film pioneers The Lumiere Brothers projected Cinematograph films onto a giant screen (400 square meters, 25 x 15) that was visible to an audience of 25,000. Fifteen films were screened in the 25-minute program. 1900 The historical re-enactment Episodes of the Transvaal War (aka La Guerre de Transvaal) (1900), a 'reconstructed' news film, had its premiere showing in Paris on New Years Day. It was filmed by Lucien Nonguet in the bois de Vincennes. 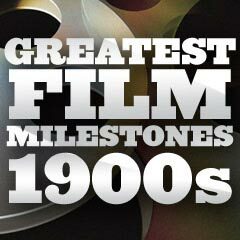 It was released by pioneering French filmmaker-producer Charles Pathe, who had formed the Pathé Frères company with his three brothers in 1896. During the early 20th century, the Pathe Brothers Company was the largest film equipment and production company in the world. 1900 Pioneering animator and film-maker James Stuart Blackton produced The Enchanting Drawing (1900), a Vitagraph Studios short film that featured a drawn character and some objects. It was the earliest surviving prototype of stop-motion (or stop-action) animation. 1900 Writer Sir Arthur Conan Doyle's Sherlock Holmes, the immortal, prototypical detective, first appeared on the film screen in a 30-second, 1900 one-reeler (registered in 1903) from American Mutoscope & Biograph Company, titled Sherlock Holmes Baffled (1900). It was the first recorded detective film on record, made specifically for one-person mutoscope viewing machines in amusement arcades.